White Fresh-water pearls necklace by Bora-Bora. 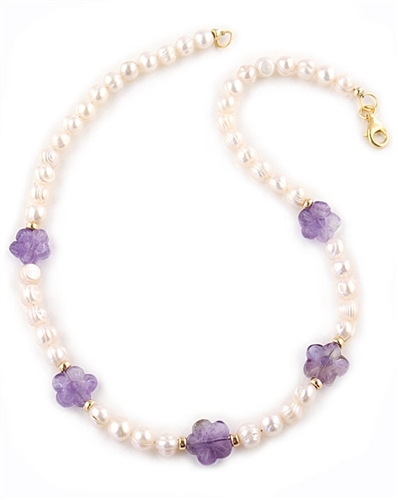 This elegant necklace features a strand of 8mm freshwater pearls, five 14mm amethyst gemstone flowers and 14k gold-filled balls. Necklace measures 43.5cm (17.3") with a gold-filled lobster clasp. This is effortlessly feminine necklace would add glamour to any outfit and will also make a wonderful gift idea.